Kerala's one of the most renowned directors Ramu Kariat's film about the Kerala fishing community and their lives based on a story by Thakazhy Shivashankar Pillai. Hrishikesh Mukherjee's tight editing helped it considerably. Kariat also took quite a gamble by asking Salil to compose the music for his film against all advice. 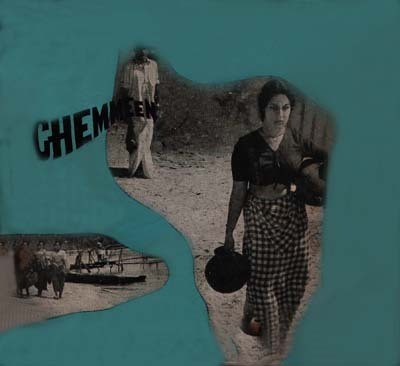 "Chemmeen" became one of the most talked about Malayalam films ever and established Salil as a household name in Kerala. Kariat later used Salil for "Ezhu Raathrikal"(1970) and "Karumbu"(1984.) "Chemmeen" received the Presidents Award in 1965. A dubbed hindi version of "Chemmeen" was later released as "Chemmeen Lahren". The songs of "Chemmeen" are still popular after all these years and the film is still as popular as ever. The song "Pennale pennale" in fact has become one of the most popular songs in Malayalam. Salil's reputation as a music director was firmly established in South India specially in Kerala. All together he composed music for over 25 Malayalam films and several Tamil,Telugu and Kannada films. Song#CM2 is really a mixture of two songs ingeniously merged together ! It starts with the melody of "shuno shuno go sabey" (Kishore in bengali film "Kobita") followed by the antara in the melody of "jaa re jaa aamaar aashaar" by Sabita which is the bengali version of "baag mei.n kali khili". After the antara Salil used the interlude music from "jaa re jaa" to great effect. Quite impressive really. Its interesting to see that the Chemmeen song and Sabita's "jaa re jaa" were recorded in 1965 where as "Kobita" was made in 1977. So one starts wondering about the origin of the melody in "shuno shuno go sabey". Song#CM3 also has some interlude music from "baag mei.n kali khili" ! Looks like Salil just couldn't get rid of that tune from his head !